Start Selling On Udemyquick Step By Step Guide (unofficial) | Free eBooks Download - EBOOKEE! You will learn how to Create a high quality , professional video course Quickly. You will learn the Udemy platform, how to film and edit and promote them for a passive income. You will understand the process of creating professional looking videos that students will love. You will know how to tweak your course for maximize profits by providing value to your students. You will Know how to write a perfect landing page that is engaging and high converting. No previous experience necessary on Udemy platform but you need a free Udemy account. Basic knowledge of using Windows Operating system. You'll need basic video and audio equipment (microphone, phone, laptop). You don't need any teaching experience but your enthusiasm and passion about your topics are essential. This course is not sponsored by or affiliated with Udemy. 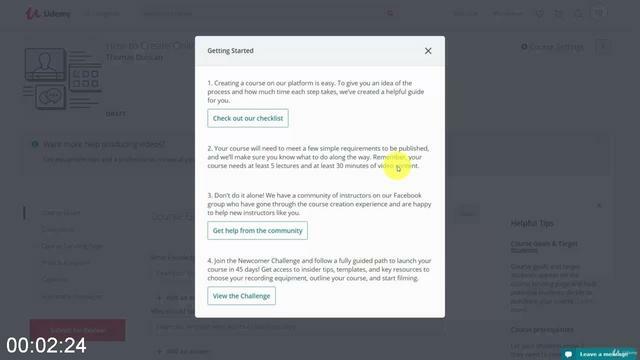 Are You Interested In Becoming An Instructor On Udemy And Create Course ? Learning To The Point Step By Step Method To Create Online Courses Quickly And Get You Started As Soon As Humanly Possible ? Udemy is FREE and at the reach of EVERYONE. The platform is robust and people are loving their online teaching service. They have grown exponentially over the past couple of years.With massive exposure through word-of-mouth / marketing, everyday, thousands of people are joining this platform.They are yearning to learn how to best use this platform to improve and grow their businesses with it. Plus, you�ll be making insane amount of money from it too! This is a very detailed 20 step-by-step video series titled ' Start Selling on Udemy:Quick Step By Step Guide.(Unofficial)'. These over-the-shoulder videos will help you understand how to best use Udemy platform to organize and grow your online business. Udemy is the world's largest marketplace for teaching and learning. As at August 2017, there are over 17 million students who registered on Udemy. Udemy has over 55,000 courses available in it's marketplace for people from all walks of life. Out of the 55,000 courses available, over 20 million course enrolments were registered. Udemy offers courses and training in 80 languages. The total amount of video content on Udemy is estimated around 5 million minutes. How to properly create courses that are guaranteed to sell where you can launch your course and sit back watching the sales roll in. How to do professional video and audio editing . You can spend a couple of days creating a course that will bring you thousands of dollars in revenue month after month. Then do it again with more courses and watch your income build up. Imagine making a full time income from recording a few simple videos and uploading it to Udemy where then it's their job to sell your course. This course is backed by Udemy's 30 day money back guarantee. if you're not getting the results we are promising you then the refund is yours no questions asked. You have absolutely nothing to lose and everything to gain. So why are you waiting for .... ? 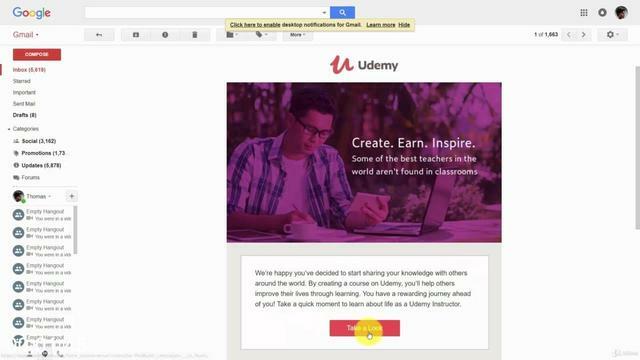 We are excited to watch you take your first step as a Udemy instructor and hope to see you on the inside! All products and services by our company are for educational and informational purposes only. Use caution and seek the advice as result may vary from person to person . While it is possible to start selling on Udemy very quickly but there is a possibility that you will end up with more time due to other factor such as , Your level of computer knowledge , Internet Speed , required software availability and your enthusiasm . Our aim for this course is to educate you with all the necessary steps to successfully launch a Course in quickest time possible. Users of our products, services and web site are advised to do their own due diligence when it comes to making business decisions and all information, products, and services that have been provided should be independently verified . 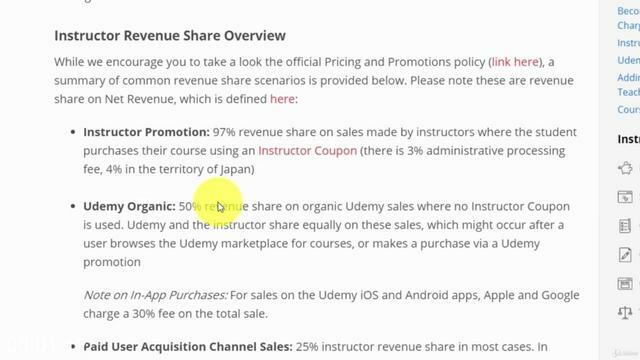 Anyone who has an interest in earning income through selling their knowledge to the udemy marketplace or platform. People who want to escape from 9-5 job and would like to start their own online video course business. No comments for "Start Selling On Udemyquick Step By Step Guide (unofficial)".